When thinking about having a Pool built for you and your family to enjoy, there are numerous choices to consider. The one item that usually enters ones mind is "what is this going to cost?". Your budget is an obvious consideration, unfortunately we allow it to control our overall buying decision. When we allow the price to be the deciding factor we risk the following: Pool construction may be built poorly, choice may require more maintenance, may not function as you thought, may not fit the architecture of the space properly, may not be a good fit for you or your family, etc. Wants- such as: Tanning Ledges, Water Features, Infinity edges, Basketball and volleyball, etc. If you are having a hard time trying to visualize what you want then you should Check out http://houzz.com. There you can find pictures on just about anything to do with a backyard area and swimming pools ideas. The next item to think about is the design or shape of your pool. You can go with a Freeform Shape that gives more of a natural look, or a geometric shape that ties more into the architecture of your home. Whichever you pick you want to make sure that the overall look of your pool gives you that WOW factor. W factor that you are looking for, such as liner over the steps, cantilever concrete (which can give the same look as a concrete or fiberglass pool), Travertine Coping and Decking, Tanning Ledges, Water Features, etc. The PROS for this type of pool are: Very low upfront costs, can build just about anything, interior can be easily changed and is very skin friendly. 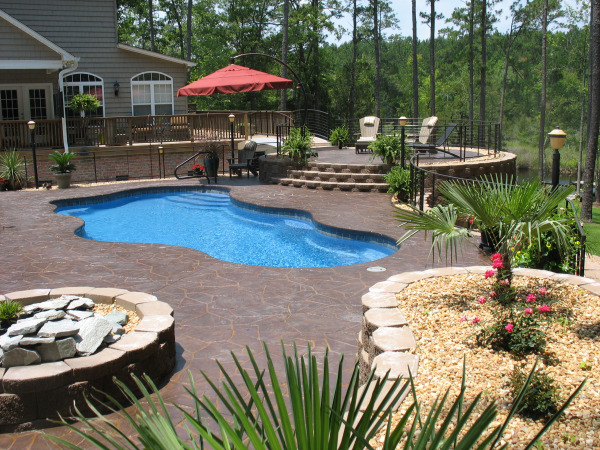 The CONS for this type of pool are: At times can be very cheap looking, liner needs to be replaced every 8 to 10 years, may not be the overall look that you are going for. 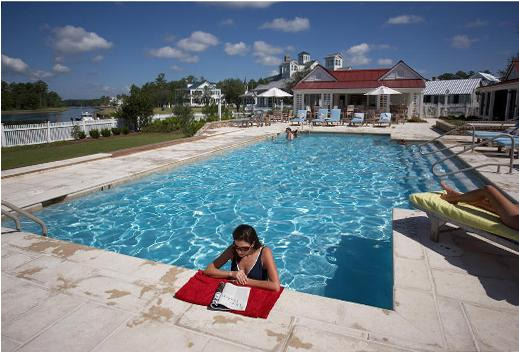 Concrete/Gunite Pools- This is the Grand Daddy of all swimming pools and the most desirable. This is the pool that you can do the most with and can give you the ultimate in high end looks. Any shape, style and size that you can imagine can be built with a Concrete Pool. Some of the popular features for these pools are: Tanning Ledges, Infinity Edges, Overflow Pools, Hot tubs, Beach Entries, Tile Finishes, Pebble Finishes, etc. One of the best features is you can easily make it any depth that you want. Most pools start a 3' entry depth, while concrete pools can easily start at any depth that you want, we usually build them with a 4' or deeper for residential pools. This type of pool is growing in popularity due to the versitlity of design and function. The PROS are: Any shape and size, Any Depths, Beach Entry and Tanning Ledges, Numerous interior Finishes, Beautiful Tile, etc. The CONS are: will need to replaster and re-tile. 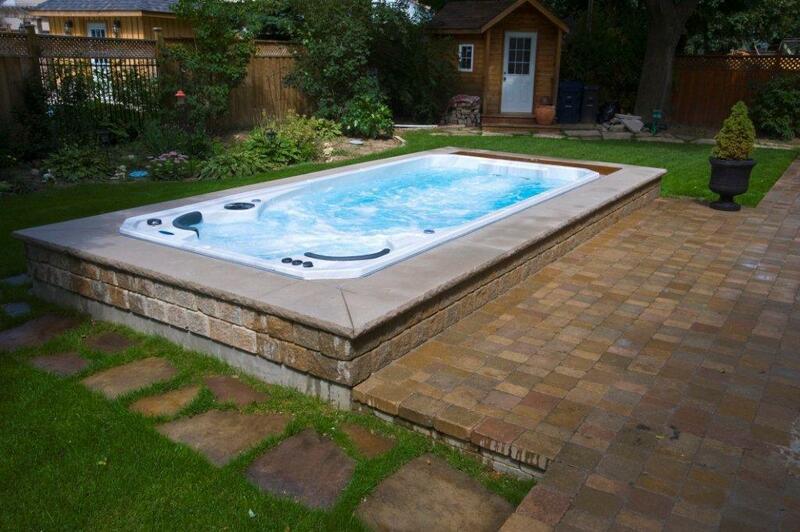 Swim Spas- This is a great way to get a lot of pool in a very little area. This type of pool can offer the following: Swimming in a current for great exercise, Walking or jogging against the current, Rowing (with proper attachements) and other types of exercise. When you exercise in the water you take a lot of stress off your joints. There is no better type of exercise than being iin the water. This type of pool will also be easy to maintain and can offer year round enjoyment. These can easily be installed on a Concrete Pad with an elevated deck or even in the ground at surface level. We have even installed these in some homes. The PROS are: Easy to install, Year Round Enjoyment, Great Exercise, Easy to take care of. The CONS are: Small size hard to accomadate large groups of people. No matter which pool you choose you and your family will enjoy it for years to come!